Gepost door My Scrambled Style op 8:35 p.m.
Wel cool, maar een beetje te hoog gegrepen voor mij. Ill take one of each! Greatshoes! Very modern and trendy! Love them! Have a great weekend! I really love all of those shoes!! Your blog is really great and very inspiring so I'm following you now! Really cool shoes! I like the yellow shoes on the third picture the most. I love yellow shoes! they are AMAZING! amazing selection! love the first one! Great shoes! !, i love the ones of the last picture!! i love the chunky block heels!! I've been following your site dear. My name is Jessica. totally need to go shoe shopping! thanks for this. i have a new post up about an editorial i styled, i'd love to know what you think! I need to do shoe shopping now I'm inspired! Following you! Heb je The Black Issue ook niet bij de Bruna gezien..? Gaaf deze blogpost...de blokhak heb ik al wat enkele jaren...Vele trend komen na een tijd weer terug..
Love the colors, great inspirational post! LOVE number 3 and 5! so gorgeous. Thanks for sharing all these pictures! Love them all, and they are all a great inspiration for shoe lovers like me! I love your blog. Wanna follow each other? De eerste en een-na-laatste zijn geweldig! heb je je love bracelet van iwantthatmusthave.nl al binnen? ik wil namelijk een tas daar bestellen. OK,I'm now following you on bloglovin #49 and gfc. FINALLY!!! FINALLY I saw someone post about block shoes!!!! You are the best!! !yea..I bought many different color combinations block this season....and I think they are great...esp with fall clothings!!! Seriously love those! All of them. Please let me know when u follow me doll! Great pictures! Love this post. Following you as well. Great photos! 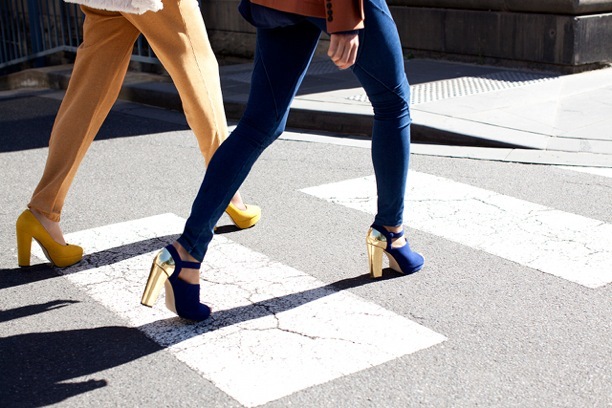 Love those gold heels :) Block heels are so much better to walk in. Thanks for the sweet comment on my blog! Leuk, vind de blauwe heels van de 3e foto echt super! Great inspiration photos! I'd wear them all! I'd wear any of these amazing shoes! I'd love to have all those pairs in my closet! So pretty! Color blocking is definitely a long lasting trend. Loving the orange and blue pair, but the black one is insuperable! OMG, these shoes are amazing! Die blauwe pumps zijn echt to die for! I like your blog, would you like to follow each other?